Business News - 'Modi Doctrine’ overcomes hesitations of history: U.S.
'Modi Doctrine’ overcomes hesitations of history: U.S. Describing Prime Minister Narendra Modi’s US visit as historic, the Obama administration has christened his vision of India-US ties that has overcome the “hesitations of history” and working for the betterment of the global good as “Modi Doctrine”. “This vision which I have come to call the Modi Doctrine laid out a foreign policy that overcomes the hesitations of history and embraces the convergence between our two countries and our shared interests,” Ms. Biswal told a Washington audience. Ms. Biswal, the Obama Administration’s point person for South and Central Asia, said this at a discussion on “Security and strategic outcomes from the Modi visit” organised on Thursday here jointly by the U.S.-based Heritage Foundation and the New Delhi-based India Foundation, both think tanks. Mr. Modi, she said, in his speech furthered his bold vision of India-U.S. partnership that could anchor peace, prosperity and stability from Asia to Africa, from the Indian Ocean to the Pacific and help ensure the security of the sea lanes of commerce and freedom of navigation on the seas. “This Modi Doctrine notes that the absence of an agreed security architecture creates uncertainty in Asia and reiterates India’s adherence to and calls for others’ support for international laws and norms,” Ms. Biswal said. India, she said, was now a key element of the Obama administration’s rebalance to Asia, a strategy which recognised that America’s security and prosperity increasingly depended on the security and prosperity of the Indo-Pacific. U.S. 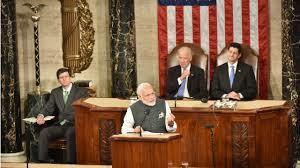 Ambassador to India Richard Verma said Washington welcomed and shared the Prime Minister’s vision. “We have made a clear and strategic choice to support India’s transition to become, as Foreign Secretary S. Jaishankar has articulated, a leading power. Our actions, as security partners in every sense of the word, speak to this endeavour,” he said.